I’m trying to think back to what has happened over the last couple of months as it all rolls into one big blur….does this ever happen to you? I never quite know whether that means we have too much on the go or if I’m starting to lose the plot as I get a bit older. Hmmm, think I’ll run with the first explanation (ha ha). Looking back through my diary we’ve had a lot on with work, which is always good. There have been numerous ecological surveys, weed surveys, a bit of fauna spotting catching, day tours and we are also in the process of updating some of our management systems and reviewing business processes. We’re also excited to announce we are looking at running an eco-science expedition next year and have gone to market to get some input before we put the program together. We put out a survey to some of our contacts and we would love you to fill it out and send it onto any friends or families who you think maybe interested in this type of thing. To say thank you for completing the survey, you will be entered in the draw to join us on tour. This is valued at over $3000. Click here to complete the 2-minute survey. Otherwise, I’ve done a bit of mustering; fixed a fence or two; put bulls out with the cows for this year’s mating season; caught and relocated a couple of snakes for people in town (using a bag and hook); participated in a regional tourism conference which was held in Roma; helped pull down a cage for the local wildlife group; trucked some cattle back from the neighbours property; continue to put out molasses for the cattle as a supplement as it is still quite dry out here; attended a corporate governance workshop to help board members effectively fulfil their roles on not-for-profit groups; the normal feed routine for animals around the homestead each day (dogs, chooks, horses, donkeys, and a couple of sheep); continue to run the kids around to school, work and their extra-curricular activities; continue to run a local junior touch football club; and attended a couple of other community organisational meetings. When I start to think about it, that’s quite a lot…possibly too much…..however I enjoy, well most of it, and a good portion I don’t think of as “work”. Oh yeah, we’ve also been looking after a Rufous Bettong, also known as a Kangaroo Rat. Check out her adorable photo. This little girl came to us after she was found in a pipeline trench during some coal seam gas construction activities. Around the age of young school child she was abandoned and had a little injury on her side. After a couple of months with us, she is healthy and happy and has not long entered her teenage years, becoming more and more independent. Very soon she will be heading to a soft release site near Roma where she will be safe while she finds her independent feet. 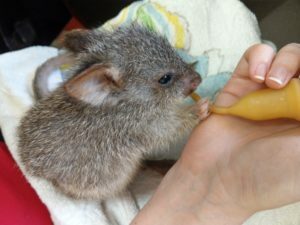 Becoming what I like to call “unhumanised” and where her natural instincts will set in and take over as she learns to cope with the real world, in Bettong terms. 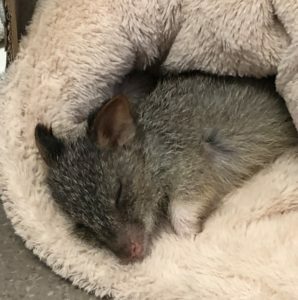 After this, she will be released into the big wide natural world again where hopefully she will successful meet some other bettongs and have a family of her own. Rufous Bettongs are a small Australian marsupial, only growing to about 80cm in length from nose to tail. 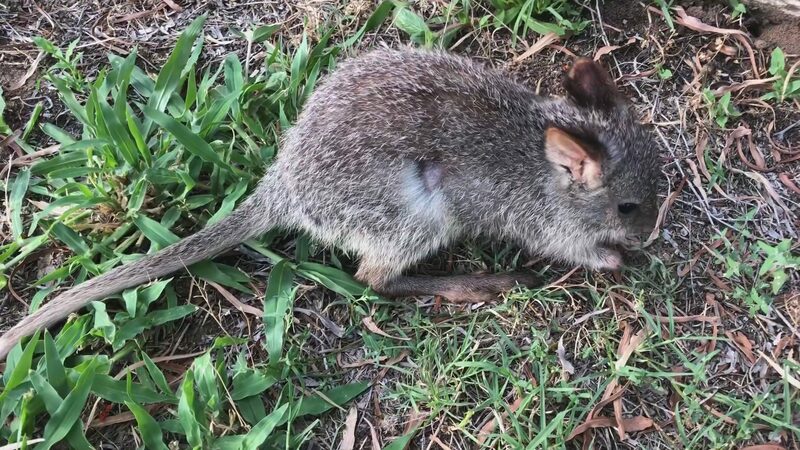 There are four other species of Bettong in Australia. Being nocturnal they sleep during the day, hidden away in a home-made of grass at the base of tussock or logs. At night, the best time to try to find them, they emerge to feed on grass, herbs, roots, fungi and insects. They are very efficient diggers, using their front claws like two rasps to dig up roots and then hold them while they chew away.